Guest Post: Loose pants, er, and belt-less . . .
Labels always make me think of childhood, and coloring books, where a parent or a kindergarten teacher would say: don’t color outside the lines. That’s what they’re there for, to guide you, to teach you (both the lines and the teachers pointing to them). Maybe it’s my Ukrainian upbringing, mixed with a ton of Jersey Shore hubris on my father’s side, because my father followed his own artistic obsessions into the painting world, and this made me question authority from an early age. Sometimes authority figures were not fair and just at all. As a child, I buckled at the system that flaunted so many of life’s unfairnesses. And, on a certain path, I followed in my parents’ huge creative footsteps, the only one of us five Bog kids to do so, to actually think I could make a living being a writer (still haven’t achieved that, but some fine day). I learned the “rules” of writing, received the best public school education, by falling for reading first. I read everything, and like so many kids of my generation, being a kid in the 70s, I had huge amounts of free time and little parental supervision. The term helicopter parent was far in the future. In learning the rules of writing, basic grammar, and reading tons of King, Carver, Irving, Jackson, Cheever, Updike, Ingalls, Straub, Atwood, and most of the classics, the stories I set down on paper became stronger, and I found that I had my own style separate from every other single writer out there in the weeds, as it should be. There’s room for every writer, and each story a writer tells is distinct. I have never viewed the writing life as a competition between myself and any other writer. Variety is good and very inspirational. My stories begin with the spark of an idea, or a vision of a character or setting where something is about to happen. In the title story of my first collection, Sandcastle and Other Stories, I remember thinking about a child’s balloon floating above a crowded beach . . . and the image of this child came into my head. She was a toddler, and not very happy about losing her balloon, the balloon her mother had just bought for her, and the mother came into being. There she was, pretty, very young herself, married, and . . . that fact led me to the words this mother spoke to her child, and . . . this made me think about who was sitting close enough to this mother and child on the crowded beach, listening to their dialogue. Then, and only then, did I begin to think about where the story would lead, and I wrote it to the end in a short form. Got it all down. In further edits, I added to the tale, inventing another character or two who interact with the two women and child on the beach, and then I set the short story aside for a long time. When I took it out again, I knew it wasn’t strong enough yet so I tinkered with the motivations, the voice of the third-person narrator, and what happened to the characters became natural. Pantser is a title I don’t mind. My stories stem from character first. How each character is introduced is important to me. I don’t enjoy reading about cardboard characters. Who does? 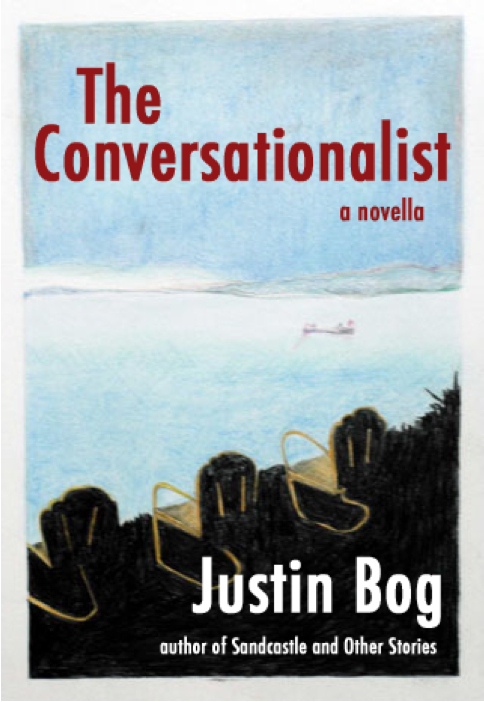 My latest psychological thriller is a novella titled The Conversationalist and the title comes from my main character’s inability to grow deep connections with the people who cross his path during the day no matter how hard he tries. There’s a stumbling block within his psyche, and this is where I began the tale, with my conversationalist on a date. Then his date came into focus, and she had her own issues. She was trying to reveal her past, something horrible and human and my conversationalist wasn’t listening very well. He faked his outward seriousness, but couldn’t quite pull it off and ended up doing something rude. By the time the date ends, the plot is set in motion, and he is haunted by the decision he made on that date because there is someone out there who wants to teach him a lesson. These two characters continue on in the seven chapters while more characters are introduced, co-workers, a sibling, students of the main character, who is a teacher, and the suspense builds. The ending is natural since the characters brought me there, and I like the atmosphere of dread that also builds. I’ve never plotted out any piece I’ve completed. Even the three novels I’ve attempted, two finished and in different editing stages, and one only a hundred pages in, there has been very little plotting, but I write the novels in a rush, a little bit at a time, daily, until the tale ends. I juggle all the character names in my head too, and usually these longer novels have huge casts. In the editing stage I fix all the errors where I used a different name for a character who was introduced with another name at the beginning . . . that does happen! I do know many writers who outline and plot out their stories, and that’s wonderful, but I tried to do that and became mired down with “knowing” the story before I wrote it. I don’t like knowing how a book ends before I read it either. Same with a film. I rarely read reviews in case they spoil the action of anything in pop culture. In writing, I like the added mystery of not knowing where a character will lead me, and because I love suspense/horror/speculative fiction my tales tend to be centered in dark places and situations. Characters must overcome something, fail or succeed in trying. Anyway, Pete, I thank you for letting me ramble on about my latest work, The Conversationalist, and how I go about plotting out a story. When I’m in the writing trenches, the outside world disappears. p.s. all of my books are available at Amazon and can be ordered from your local bookseller as well (The Conversationalist is an eBook only). Thank you for guest posting, Justin. I like the fact we have another view-point to the Pantser v Planner debate. Links to Justin’s Amazon UK page and his Amazon’s US page. This entry was posted in E-Book, Guest Post, Writing and tagged Books, Guest Posts, Justin Bog, pantser vs. plotter, Reading, The Conversationalist, Thrillers, Writing. Bookmark the permalink. 9 Responses to Guest Post: Loose pants, er, and belt-less . . .
thanks again, Pete . . . love sharing the writing life and hearing how other writers create their tales. Just keep writing. I also was a kid in the 70’s with huge amounts of free time, little parental supervision and a voracious appetite for reading, anything and everything… and still do. Colouring in is overrated – drawing is far better. And if you can take what was absorbed from all that reading, and write something yourself, plotted or pantsed it’s a wondrous thing. Really nice of you to share your thoughts, EllaDee…wasn’t being a child of the 70s fun? I believe I’m more independent because of the way children were raised back then (and before) . . . love reading and always have a book in my back pocket! Great post, Justin. I love your writing philosophy — and I never read any of those quotes before! Often, I am stuck on a plot point, where my characters have backed themselves into a corner, and I use my alone time to try to imagine a different pathway, some way out, and it is usually these hopeless times when a moment of epiphany will hit me and I will race back to write more, get the new thoughts down on paper. If I am surprised by where a story takes me, maybe other readers will be too. Thank you for sharing. Thanks for this post, Justin. I love reading about how other writers approach their work. nice to hear from you, 4amWriter, and, Wow, I am so not an early morning writer . . . need lots of espresso — happiest of creative days to you. As long as words get on the page, the process works. 🙂 Glad to hear pantsing works for you Justin. I really like that you tried plotting before you dismissed it as not for you.